22-Mar-2002 -- This is our second trip to visit confluences in Sweden during winter time. Going further north, we take ski with us which most of the times is very helpfull to reach the points. The small road we originally wanted to follow was not swept, so we decided to drive to Åjarn and go by ski following a shorter path. A sign said end of the public highway and so we felt we were staying at the edge of pure nature. 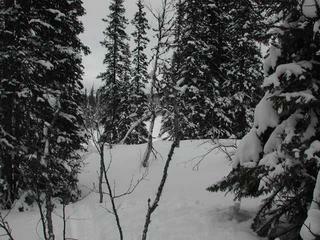 First we could follow a track of a snowmobile but missed a branch and went into the wrong direction for a certain time. We turned back and choose the right way walking on skis through deep snow, sinking in up to the calfs sometimes. We strained every muscle and finally made it. But before our "victory" we had to cross a small, already flowing river. The snow bridge broke under our weight and we barely made it back to the safe shore ! The reception of the GPS was bad so the position seen on the picture was the best we could get.